Although Trump pledged to raise the issue with Russian President Vladimir Putin “if and when we meet,” it is not at all clear what his strategy is for dealing with the matter. How he handles the worsening dispute over INF Treaty compliance will affect his ability to follow through on his stated desire to make deals with Putin on other issues. Even with Republican Party control of the executive and legislative branches of government, Trump’s flexibility will be constrained by questions about whether his campaign colluded with Russia in the 2016 elections and by the large number of arms control skeptics and Russophobes among Republican members of Congress. It is difficult to overstate the impact of the INF Treaty on the course of modern European history and the evolution of the international security order. Along with the Soviet Union’s withdrawal from Afghanistan, Moscow’s failed attempt to expand its monopoly in long-range, nuclear-tipped theater missiles marked the twin military policy disasters of the regime’s last decade.. At the same time, Moscow’s partnering in the elimination of an entire class of U.S. and Soviet nuclear weapons in U.S. and Soviet constituted one of the world’s most dramatic achievements in curbing the nuclear arms race. The unprecedented results ultimately achieved by the treaty seemed far from likely in the late 1970s, when the Soviets began replacing their single-warhead SS-4 and SS-5 theater ballistic missiles with the longer-range, more mobile triple-warhead SS-20 missiles. Meanwhile, it was clear then that the prospect of counterdeployments by NATO members would generate serious resistance among European publics long before they would yield effective leverage for negotiating Soviet reductions. NATO’s “Dual-Track Decision” on theater nuclear modernization and arms control in December 1979 called for deploying 572 U.S. intermediate-range missiles in five countries of the alliance, while offering to negotiate lower limits that would reduce the Soviet missile forces already deployed and the number NATO planned to deploy. Alliance strategists hoped that these new missiles would reduce NATO’s reliance on increasingly vulnerable aircraft based in Europe for theater delivery of nuclear weapons. At the same time, they calculated that beefing up longer-range nuclear forces would facilitate the reduction of some 7,000 shorter-range nuclear weapons, deemed no longer necessary militarily and increasingly burdensome politically. By the end of 1981, negotiations had commenced in Geneva. The United States opened with a “zero-zero” proposal, offering to cancel plans for future U.S. INF missile deployments in exchange for elimination of all existing Soviet INF missiles. Seeking to prevent the deployment of any U.S. INF missiles, Moscow argued that British and French nuclear forces and U.S. nuclear-capable aircraft based in Europe should be taken into account in calculating the balance, but not Soviet forces based outside of Europe. Over time, Moscow offered some reductions of existing Soviet INF missiles in exchange for complete cancellation of NATO’s planned modernization. Yet, the real action during the first three years of the INF Treaty negotiations was in the streets and parliaments of Europe’s NATO members. After narrowly failing in late 1983 to prevent NATO’s initial INF deployments in the United Kingdom and Germany, the Soviets walked out of the Geneva talks in protest. Subsequently, the Soviets returned to the table, agreeing to conduct INF Treaty talks as part of broader negotiations that would also include strategic arms and missile defenses. Under new Soviet leader Mikhail Gorbachev, Moscow eventually accepted not only the U.S. zero-zero formula, it challenged the alliance also to eliminate short-range missiles with ranges between 500 and 1,000 kilometers. The anti-nuclear sentiments of President Ronald Reagan and his Soviet counterpart and those of European publics ultimately prevailed over the best laid plans and preferences of many security experts in Washington and Moscow. 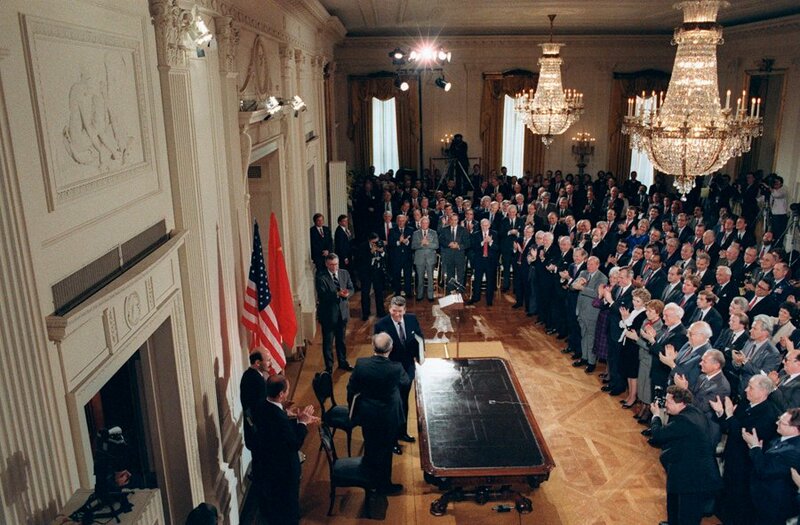 The INF Treaty was signed on December 8, 1987, and ratified the following year. Nearly 2,700 missiles were eliminated under the treaty. Equally important was the establishment of new precedents for on-site inspections and other up-close verification measures, paving the way for the first Strategic Arms Reduction Treaty (START), concluded in 1991. NATO’s dual-track approach was considered an impressive application of collective action by the diverse and deeply divided societies of the Western alliance against Soviet threats and intimidation. Ironically, Russia’s apparent willingness now to develop and deploy GLCMs in violation of the INF Treaty’s ban on such systems threatens to have equally momentous consequences. If such a serious compliance challenge to the treaty is not satisfactorily resolved or at least managed, it will be very difficult to make further progress on U.S.-Russian strategic arms reductions. Such a failure also could invalidate the assumptions behind the disarmament and nonproliferation commitments incorporated in the nuclear Nonproliferation Treaty (NPT). This pillar of the existing international order is already under threat from the assertion of a right to “go nuclear” by such countries as North Korea and the potential effects of the nuclear ban movement, challenging the bona fides of the five original nuclear-weapon states’ commitment to their NPT disarmament obligations. Many in Russia have long viewed the INF Treaty as discriminatory to Moscow. They see the treaty as imposing a heavier burden on Russia, which, unlike the United States, is ringed by third countries with nuclear-tipped INF-range missiles. These Russian domestic critics also believe the treaty is inhibiting Russia’s effective use of its nuclear forces to compensate for deficiencies in conventional military capabilities. In the United States, some believe the INF Treaty, whatever the value of its past contributions, is no longer necessary and now represents an undesirable constraint on U.S. pushback against Russian aggression and intimidation. Despite critics in both countries, the U.S. and Russian governments still pledge fidelity to the treaty. Kremlin spokesman Dmitry Peskov told reporters March 9 that Russia rejects U.S. violation claims and remains committed to its international obligation “including those arising from the INF Treaty.”3 Yet without movement toward resolution of INF Treaty compliance issues, the prognosis for this treaty is poor, and the prospects for any future nuclear arms reduction treaty will recede beyond the horizon. The New York Times, citing anonymous U.S. officials, first reported in February 2017 that the INF Treaty-class cruise missiles, which the United States in 2014 accused the Russians of testing, have been deployed.4 This news account said that two battalions of GLCMs, designated “SSC-8” in the West, have been formed, with one battalion “shifted in December from [the] Kapustin Yar [test site] to an operational base.”The deployment news is interpreted by many in NATO as the latest evidence, on top of reckless behavior by Russia’s air and naval forces in the Baltic and Black Sea regions and Putin’s rhetorical nuclear saber-rattling, that Moscow is seeking to intimidate alliance members. Another cause for concern is Russia’s recent deployment of the SS-26 Iskander-M short-range ballistic missile system into Russia’s Kaliningrad exclave, between Poland and Lithuania, putting a significant portion of Poland within striking distance from Russia’s tactical, ground-based, nuclear-capable missile forces. Such deployments, however, do not violate the letter of the INF Treaty and do not fundamentally alter the strategic equation in the region. Moscow, meanwhile, expresses similar concerns regarding the reinforcement of NATO combat forces on its periphery. 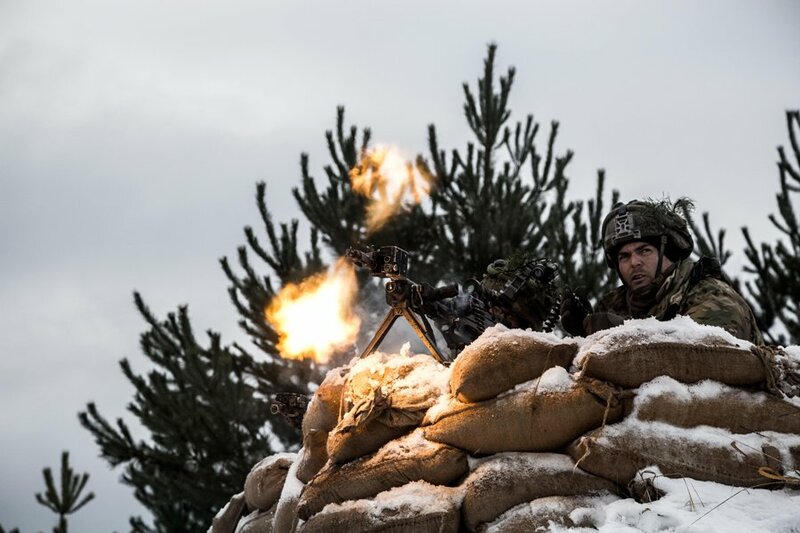 The implementation of a NATO decision to rotate four multinational combat battalions through Estonia, Latvia, Lithuania, and Poland has prompted Russian complaints that such measures constitute a new security threat and will require countermeasures. Yet in this case too, the impact is more political than military because the regional balance of forces in the Baltics remains overwhelmingly tipped in Russia’s favor. Beyond the legal and technical issues is the credibility gap opened by U.S. unwillingness to adapt its Aegis Ashore deployment schedule to the significant diminution in the missile threat from the Middle East against which NATO justifies these deployments. When the Polish missile defense site was planned in 2009, the United States was projecting the near-term possibility that Iranian long-range, nuclear-tipped ballistic missiles could threaten all of Europe. Yet, with conclusion and implementation of the 2015 Iran nuclear deal and the absence of any long-range missile testing by Iran, that threat has receded far beyond the 2018 deadline for declaring operational more advanced missile defenses in Poland. For Moscow, the continued construction there constitutes confirmation of long-standing suspicions that these systems are directed against Russia rather than Iran. In 2014, Russia raised two other allegations of U.S. noncompliance with the INF Treaty. Those are that the United States continued to test missile targets under its ballistic missile defense program that have characteristics similar to intermediate- and shorter-range missiles and that these tests are used to improve key elements of missile systems prohibited under the INF Treaty, and that the United States is increasing the production and use of “heavy strike” unmanned aerial vehicles that conform with the INF Treaty definition of GLCMs. Moscow did not rank the three allegations in terms of seriousness—all were raised in response to U.S. charges—but it appears to regard Aegis Ashore as its best case for arguing U.S. noncompliance. The issue of using INF missiles in missile defense tests had been raised and extensively discussed during previous meetings of the Special Verification Commission (SVC), the body created by the treaty to address alleged violations. There was little mention of the issue subsequently for more than a decade. U.S. use of armed drones was initiated long before Russia expressed concerns that such use violated the INF Treaty. Despite worsening relations between Washington and Moscow and continuing belligerence between Moscow and Kiev, Russia and the other active states-parties to the treaty (Belarus, Kazakhstan, and Ukraine) agreed to the U.S. request for a meeting of the SVC in Geneva to take place on November 15-16, 2016. This 30th meeting of the SVC constituted the first session held since 2003 and took place more than two years after the United States levied public charges of noncompliance against Russia. Few details were released on the content of the discussions, and no follow-on meeting has been announced. It is reasonable to assume that little substantive progress was made in this short session. Nonetheless, the parties’ decision finally to engage the treaty’s designated mechanism for resolving compliance issues is a positive development. Activating the SVC mechanism was consistent with the recommendation in last June’s report of the Russian-U.S.-German Deep Cuts Commission, titled “Back from the Brink.”6 The group of former government officials and arms control experts called for “supplementing ongoing diplomatic dialogue with technical expertise, either by convening the [SVC] or a separate bilateral experts group.”7 In order to achieve satisfactory resolution, political authorities need to provide impetus for continuing work at the technical level. • Technical experts could work out language making clear the difference between prohibited intermediate-range ballistic missiles and permitted target missiles for missile defense tests. • While armed unmanned aerial vehicles, which Russia and the United States are developing and deploying, do not clearly fit the treaty definition of cruise missiles, their differences could be more clearly spelled out in language drawn up by technical experts working under SVC auspices. The separate category of weapons, so identified, could be subject to future negotiations with the purpose of limiting their scope. • Transparency measures could be established with respect to the MK-41 Aegis missile defense launchers deployed in Romania and to be deployed in Poland. Russian inspectors could be invited for initial on-site examination of the system and subsequent periodic visits to ensure that no banned INF Treaty categories of missiles were being deployed. The United States and host government might tie invitations for such visits to reciprocal inspection visits to Russia to resolve suspicions about GLCM deployments. • It may not be possible to conclusively establish whether GLCM tests alleged by the United States had occurred and the parameters of the violation, but it should be less difficult to employ national technical means to establish whether new Russian GLCMs have been deployed. Moreover, on-site inspection measures could be devised that would increase confidence that such deployments had not taken place or were being reversed. It is still possible to find ways to restore the health of the INF Treaty using properly structured discussion of compliance issues in the SVC, fusing political will with the application of technical expertise. U.S. willingness to allow Russian access to deployed MK-41 Aegis launchers and Russian willingness to accept on-site monitoring of SSC-8 GLCM launchers at test sites and challenge inspections at suspect deployment sites could lead to a breakthrough in the current compliance stalemate. If measures can be found to differentiate launchers that appear to be capable of launching cruise missiles or missile defense interceptors or to differentiate cruise missiles from armed drones that may have similar missions and characteristics in the future, it will help clear away obstacles to restoring the health of the INF Treaty and open up possibilities in other areas. “Fixing” the INF Treaty will require political initiative in Washington and Moscow. Unfortunately, in neither capital is the current political environment favorable for resolving the compliance issues and removing the obstacles to progress in nuclear arms control. Disputes over Russian actions in Ukraine and Syria, along with questions about Moscow’s alleged efforts to tilt the U.S. presidential election in Trump’s favor, weigh on relations between the two superpowers. During his successful campaign for president, Trump frequently expressed admiration for Putin’s strength and leadership. As president-elect, he continued to praise Putin and chose a secretary of state who had extensive successful business dealings with Russia’s leadership. For his part, Putin made favorable gestures toward the incoming U.S. president, including a decision not to impose reciprocal measures following President Barack Obama’s late-stage expulsion of 35 Russian diplomats in response to alleged Russian interference in the U.S. presidential election. Yet, in the early days of the new administration, a significant fissure is emerging within and between the executive and legislative branches on the conduct of U.S.-Russian relations. Although the Republican Party controls the White House, the Senate, and the House of Representatives, no consensus has formed on policies toward Russia. Many key members of Congress have expressed alarm over alleged Russian hacking activities, deep skepticism of Putin’s motives, and hostility to the idea of bilateral cooperation. Only two days after publication of news reports that Russia had deployed illicit GLCMs, Senators Tom Cotton (R-Ark. ), Ron Johnson (R-Wis.), and Marco Rubio (R-Fla.) introduced legislation that would allow U.S. countermeasures, including the development of similar systems.8 Rep. Mike Rogers (R-Ala.), chairman of the House Armed Services strategic forces subcommittee, asked at a Mar. 8 hearing that the U.S. military provide Congress with response options by the end of the month. As with INF Treaty issues during the Cold War, the views of U.S. allies in Europe are critical to successful resolution of the current compliance issue. Any U.S. move to violate the INF Treaty in response to a Russian violation would be likely to elicit deep divisions in NATO and to provide Moscow with an excuse to withdraw from the treaty. Meanwhile, Russia and the United States are under increasing diplomatic pressure from the majority of non-nuclear-weapon states for failing to make sufficient progress on eliminating their nuclear weapons, as called for in the NPT. At the UN General Assembly on December 23, 113 states voted to convene a UN conference in 2017 “to negotiate a legally binding instrument to prohibit nuclear weapons, leading towards their total elimination.”9 Growth in the perception that the INF Treaty, one of the signal achievements in nuclear disarmament, is unraveling could strengthen international support for the nuclear weapons ban talks that Washington and Moscow vigorously oppose. The appropriate advice to the White House and Congress at this stage therefore would be “first, do no harm.” Continued Russian deployment of SSC-8 GLCMs will be increasingly difficult to hide and deny, and Russia should not be given cover by the United States committing reciprocal violations of the treaty. A wiser course to pursue would be in the realm of arms control initiatives that could be mutually advantageous to Washington and Moscow and supported by the international community. Given the apparently weak political support in Russia for preserving the INF Treaty, it may be necessary to exploit Russia’s greater interest in keeping a lid on U.S. strategic arms and preventing the enlargement of strategic missile defenses, which could jeopardize Russia’s nuclear deterrent. Putin has signaled Russia’s continuing interest in strategic constraints, reportedly urging a five-year extension of the New Strategic Arms Reduction Treaty (New START) during his initial telephone conversation with Trump in January. Putin presumably understands the implications of U.S. “fuzing” improvements for counterforce strikes10 and the U.S. numerical advantage in strategic warhead upload capacity. Moreover, his interest in constraining U.S. missile defenses is manifest. Another way to revive the INF Treaty would be to convert the GLCM ban to a limit on all nuclear-tipped INF-range missiles by deeming the warheads on such systems to be “strategic,” prohibiting all nuclear-armed missile deployments, or banning all INF nuclear warheads altogether. Any of these options could be accommodated within Pifer’s tiered nuclear arms control framework. Several knotty INF Treaty problems could be addressed through the denuclearization of cruise missiles while advancing progress on nuclear disarmament overall. Ongoing trends in weapons development exacerbate the treaty compliance issues now in dispute because of the newer weapons’ similarities to weapons banned by the treaty. One of the weaknesses built into the treaty was the differential treatment of nearly identical land-attack cruise missiles based on the nature of their launch platforms. All ground-based INF-range cruise missiles were banned; all air- and sea-launched cruise missiles (ALCMs and SLCMs) with similar capabilities were unconstrained.12 As technology advances and launchers become more interchangeable, these dissolving system boundaries between ALCMs, SLCMs, and GLCMs and the absence of cruise missile limits in New START undermine the effectiveness of nuclear arms control limits. Washington and Moscow appeared committed to withdrawing all land-attack nuclear SLCMs under the nonbinding Presidential Nuclear Initiatives of 1991-1992. Although the United States withdrew its tactical nuclear weapons from surface ships, attack submarines, and naval aircraft and phased out its nuclear-armed SLCMs entirely, Russia is believed to be continuing its deployment on submarines and surface warships. Both countries continue to deploy nuclear-armed ALCMs in their strategic arsenals. Russia is equipping its heavy bombers with new nuclear-tipped Kh-102 ALCMs. The United States is planning to replace its current ALCMs, launched from strategic bombers, with the nuclear-capable long-range stand-off cruise missile. Yet, the long-range stand-off missile program has generated vigorous opposition in the United States among many security experts, including former Defense Secretary William Perry,13who consider the program unnecessary and destabilizing. California’s senior senator, Dianne Feinstein (D), has consequently called for a global ban on all nuclear-tipped cruise missiles.14 Even Trump’s defense secretary, Jim Mattis, conspicuously failed to endorse the program during his confirmation hearings. Moscow’s willingness to consider precluding nuclear-armed systems may be more plausible than it has previously appeared. The Russian military has been following the course of the U.S. military, placing increased emphasis on highly accurate, conventionally armed cruise missiles, reducing the requirements for its nonstrategic nuclear forces. To extend limits on all nuclear-armed cruise missiles, data would be exchanged on the disposition of all ALCMs, SLCMs, and GLCMs capable of nuclear weapons delivery. As an interim measure, all nuclear-armed cruise missile warheads would be de-mated and consolidated in a few, heavily monitored storage facilities. Although the unprecedented transparency measures necessary to achieve high confidence in ultimately achieving warhead elimination would be difficult to negotiate, interim measures to securely isolate warheads from their delivery systems would be easier. As the INF Treaty demonstrated, confirming the complete absence of systems is often less challenging than trying to count the number deployed. As NATO and the Soviet Union discovered in the 1980s, effective constraints on INF missiles are an essential component of strategic arms control. The extensive transparency measures of the INF Treaty, including data exchanges, on-site monitoring, and challenge inspections, and the decision to create a ban rather than a limit on the most destabilizing systems were critical milestones on the path toward concluding the first treaty to reduce strategic arms. INF arms control led the way then, and it can do so again. 1. Steve Holland, “Trump Wants to Expand U.S. Nuclear Arsenal, Make It ‘Top of the Pack,’” Reuters, February 23, 2017. 2. Michael Gordon, “Russia Had Deployed Missile Barred by Treaty, U.S. General Tells Congress,” The New York Times, March 8, 2017. 3. Frederik Pleitgen, Alla Eshchenko, and Laura Smith-Spark, “Russia Denies Deploying Cruise Missile in Treaty Breach,” CNN, March 9, 2017, http://www.cnn.com/2017/03/09/europe/russia-us-cruise-missile-treaty/. 4. Michael R. Gordon, “Russian Cruise Missile, Deployed Secretly, Violates Treaty, Officials Say,” The New York Times, February 14, 2017. 5. The BGM-109G ground-launched cruise missile banned by the Intermediate-Range Nuclear Forces Treaty was a variant of the Tomahawk. 6. Deep Cuts Commission, “Back From the Brink: Toward Restraint and Dialogue Between Russia and the West,” June 2016, http://deepcuts.org/images/PDF/Third_Report_of_the_Deep_Cuts_Commission_English.pdf. 7. Ibid., pp. 9, 25. 8. Michael D. Regan, “Republican Bills Counter Russia’s Apparent Violation of Nuclear Arms Treaty,” NewsHour, February 18, 2017. 9. UN General Assembly, A/RES/71/258, December 23, 2016. 10. Hans M. Kristensen, Matthew McKinzie, and Theodore A. Postol, “How U.S. Nuclear Force Modernization Is Undermining Strategic Stability: The Burst-Height Compensating Super-Fuze,” Bulletin of the Atomic Scientists, March 1, 2017. 11. Steven Pifer, “Nuclear Arms Control Choices for the Next Administration,” Brookings Arms Control and Non-Proliferation Series Paper, No. 13 (October 2016), https://www.brookings.edu/wp-content/uploads/2016/10/acnpi_20161025_arms_control_choices_final.pdf. 12. When the Strategic Arms Reduction Treaty (START) entered into force, air-launched cruise missiles (ALCMs) became subject to the warhead limits attributed to deployed intercontinental ballistic missiles, deployed submarine-launched ballistic missiles, and deployed heavy bombers; but under the New Strategic Arms Reduction Treaty (New START), ALCMs were no longer counted under deployed warhead limits. 13. William J. Perry and Andy Weber, “Mr. President, Kill the New Cruise Missile,” The Washington Post, October 15, 2015. 14. Dianne Feinstein, “There’s No Such Thing as ‘Limited’ Nuclear War,” The Washington Post, March 5, 2017. 15. Deep Cuts Commission, “Back From the Brink,” p. 26. 16. Unlike START, which had a separate sublimit combining deployed missile warheads with ALCMs attributed to heavy bombers, New START counts each heavy bomber as equivalent to one strategic ballistic missile warhead, no matter how many ALCMs it carries. U.S. bombers carry substantially more than their Russian counterparts. 17. Such research is conducted by a variety of organizations, such as the United Kingdom’s Verification Research, Training and Information Centre and the Nuclear Futures Laboratory of Princeton University in the United States. The UK/Norwegian Initiative’s working paper submitted at the 2015 Nuclear Nonproliferation Treaty Review Conference is an example of the kind of research conducted on improving nuclear warhead verification measures. See 2015 Review Conference of the Parties to the Treaty on the Non-Proliferation of Nuclear Weapons, “The United Kingdom-Norway Initiative: Further Research Into the Verification of Nuclear Warhead Dismantlement,” NPT/CONF.2015/WP.31, April 22, 2015. Greg Thielmann is a retired U.S. Foreign Service Officer, who worked on intermediate-range missile arms control issues in the U.S. Department of State, participating in the initial round of negotiations on the Intermediate-Range Nuclear Forces (INF) Treaty. He was subsequently an office director in the State Department’s intelligence bureau, senior staffer on the Senate Intelligence Committee, and senior fellow at the Arms Control Association.